It's very common for people who have dementia to wander off on their own. When that happens, frantic family members have to search for them, and call the police if they can't find them. But there's now another option. Technology -- in the form of shoes that have GPS tracking -- is beginning to revolutionize how caretakers keep tabs on their loved ones who sometimes wander. Joann Johnston, whose husband, Bill Johnston, has Alzheimer's disease, said the shoes give her peace of mind. "When I lost him, you, you kind of panic," she said. "I had been leaving him and going to the bank and say, 'OK, go in, drink your tea and wait for me, and I will come back.' And he would do that," Joann Johnston explained. "(But one time) I spent a little longer in the grocery store and got back maybe 45 minutes later, and I looked in McDonald's and he wasn't there. I opened the bathroom door and hollered 'Bill.' No answer." Bill Johnston, who is 83 years old, had wandered away toward a main highway. She picked him up and brought him home. Bill Johnston is one of an estimated 5.3 million Americans who suffer from Alzheimer's disease, and wandering is one of the most common symptoms. 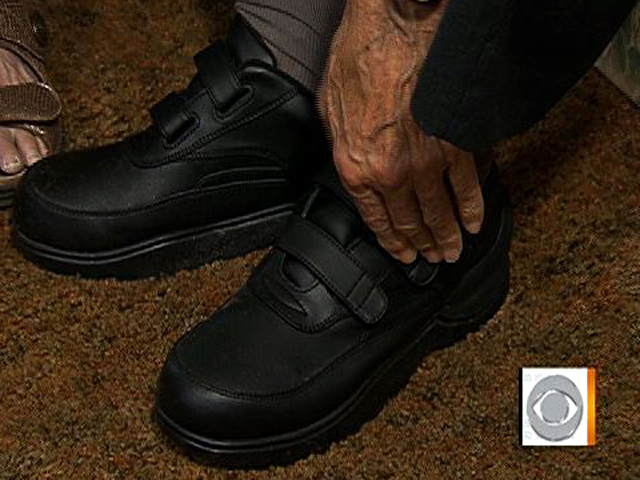 According to the Alzheimer's Association, many will wander at least once during the progression of the disease, and many, three or more times which, Quijano noted, can make shoes loaded with GPS technology a literal life-saver, and ease the burden often placed on primary care-takers. Andrew Carle, executive in residence of senior housing at George Mason University, saw a need to curb wandering and reached out to a California company that makes shoes with GPS systems. They partnered on a model for the elderly. "(Primary caretakers are) afraid to even turn their back on their loved ones for two or three minutes or even to go to the bathroom for a few minutes, because they're afraid when they come out, they may be gone," Carle said. "And this technology can really help them and gives them a chance of locating them." Seeking ways to control Bill Johnston's wandering, Joan Johnston and son Alan Johnston were led to George Mason University and Carle, who offered them a pair of shoes to test. "We discussed it and we decided to try these shoes out on him," Alan Johnston said. "And (we) thought this would be a good match and kind of went from there." A computer programmer, Alan Johnston takes care of the technological side of things for his parents. "The shoes give you more control," Alan Johnston said. "My mom can call me immediately and I can give her immediate feedback on his location." Carle said, "We're trying to maximize the odds that they're going to have this technology on them and the best location is to put it in shoes." Joan and Bill Johnston hope it will make their lives easier. The philosophy Joan lives by? "You take it day-by-day and moment-by-moment and try not to plan too far ahead," she said. "I don't plan more than a day ahead of time. And you take it, today." Carle also worked closely with a company in New Jersey Aetrex, on the shoe. The GPS shoes can be ordered now here.